She wasn't quite convincing, but she certainly warned me. 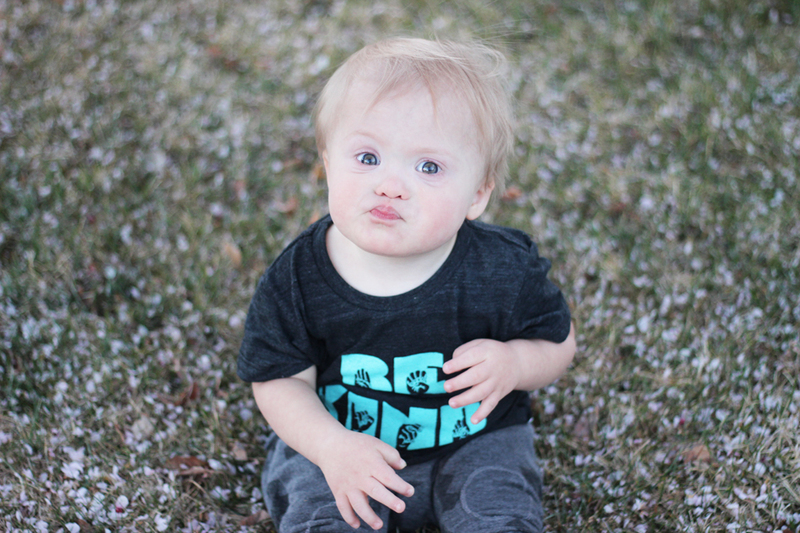 We connected over our sweet, extra chromosome-blessed little boys right after Welles was born. She's about two years further into the game than I. Her handsome little guy is turning four this year. Welles will be two. She's a step ahead of me and my saving grace much of the time. I call her late at night with questions when Welles is sick or sometimes just to tell her about some silly new gesture he has picked up. We laugh a lot together and celebrate our boys and all that they are. We have big plans for their friendship as they grow up together. Most of the time our conversations about the boys are light and fun as we enjoy this unique road we are on. Together, we get to recognize what a blessing it is and feel so lucky that we get to be a big part of their journeys. But once in a while we talk about the hard stuff... The way their needs may cause for some challenges in our families, things we are afraid of facing because maybe it's going to be unfamiliar, and our hopes that others will love and accept them the way we pray they will. Milestones and "keeping up" have never been a big worry to me. With Scarlett I almost laughed when her pediatrician suggested looking into physical therapy because she wasn't walking at fifteen months. Holy moly, the girl was practically talking in full sentences while crawling on her hands and knees and probably not walking because everyone was expecting it. She likes to keep us on our toes after all. It didn't bother me in the least that most of the toddlers her age were running around as they had been for months while she stayed on all fours. At sixteen months she decided she was ready, and on her feet she went. Did I mention that at 3.5 she still refuses to potty train? And I refuse to push her. When Welles was a new baby I figured we were a pretty good fit. He would likely fall behind from a young age, and as mentioned above, I never let "keeping up" consume me as a young mom. Just one more thing to solidify that we were the perfect match. But like I said, she did warn me. My dear friend explained that watching her boy fall behind, even as a toddler, can be very hard and suggested I prepare for it. I assured her that I wasn't worried about it. Milestones after all, had never been a real concern of mine. I love Welles' differences and that he gets to be a baby longer than a typical child. It's adorable watching him wiggle around on his belly like an inchworm and reach for me like a very dependent baby does. I relish in his extra long cuddles and attachment to his mommy. But lately I have felt that little sting she was talking about... The sting I just knew wouldn't come for years and years. So here I am, admitting it. It would be nice for him to be more toddler-ish sometimes. I wouldn't mind if he could feed himself normal foods rather than me pureeing every little thing down to a mush and then spoon-feed it to him. Life would be easier and my back would be in less pain if he could just walk himself from here to there. It wouldn't be awful if he knew how to speak and communicate a little better. I wouldn't hate it if he learned how to drink from a sippy cup or even a bottle so his only source of hydration wasn't through constant breast-feeding. Between mine and Scott's sisters, three babies have been born after Welles. One is only seven months old. Already they have all surpassed him in those milestones "I care nothing of". Every time we get a text or a picture of our beautiful niece or nephew's first crawl or steps, I am thrilled and excited as a good aunt should be. And then I do feel it - that sting she was talking about. It's not loud and it's not terribly painful. But it is there and I don't think it makes me a bad mom to feel it.